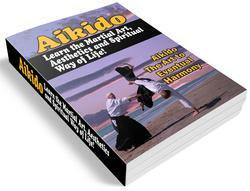 This is the two-armed version of the Arm-Dropping Exercise (Udemawashi Undo) done forward and in reverse. 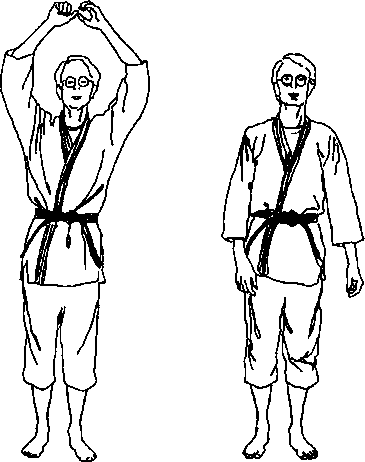 Raise left arm as high over the head as possible without straightening elbow. Drop the left arm forward (and return) four times. Drop the right arm forward (and return) four times. 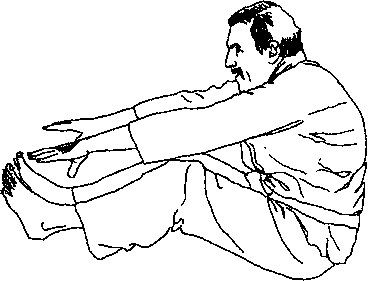 The tendency is to raise One-Point while raising arms; the challenge is to leave One-Point in place while simply returning the arms to their starting position. Looking up through fingers you should see fingers and ceiling — not walls or thumbs. A sword is held overhead in this same position. When arms are lower, they restrict the view of the surroundings. Arms held correctly do not. Raise both arms straight up. Drop both arms while dropping One-Point. As arms ascend, return to starting position.